You know the kind of book you buy for its title, knowing nothing about it but that it speaks to you? That is what Life Would Be Perfect If I Lived in That House is to me. I pre-ordered it last summer, while I was avidly apartment-hunting, job-hunting, and wedding-planning, and found myself in that position of total life upset where I just wanted that one perfect thing to cling to as my source of stability. But that's just a long, rambling way of saying that Meghan Daum's title spoke to me. 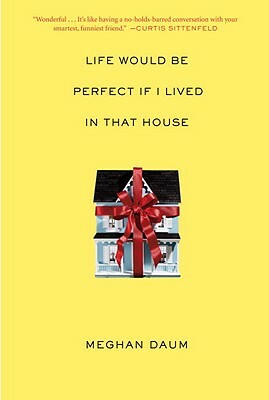 Life Would Be Perfect If I Lived in That House is Daum's funny, witty, and brutally honest tale of her own quest to locate, purchase, settle in, decorate and perfect a home. She calls it the "imperfect life lived among imperfect homes," and she is spot-on in that. From New York City to a farm in Nebraska to a loft in LA, through the housing crash and back again, Daum covers every apartment, house, and sofa she lived in from the day her parents moved her from Austin, TX to a house in NJ until her current dwelling (I won't give it away, even though her jacket bio does). "One of the many tragedies of college life is that it's almost developmentally impossible to have the wisdom to understand that contentment, which implies some sort of sustenance over time, can be an infinitely taller order of happiness, which is often inherently fleeting. It's also unfortunate that your average college student lacks the presence of mind to tell someone to f*** off when he spouts such bong-hit-fueld twaddle about the meaning of passion." Daum's writing at times reminded me of Chelsea Handle, though not as crass. Life Would Be Perfect If I Lived in That House (which, though I love the title, makes for a really long link, people) is a frank, honest monologue (it's not a conversation because it's one-sided). Daum writes with a sense with a humor born of bluntness, and a sense of philosophy born of Elle Decor. Anyone who's ever moved, decorated, furniture-shopped, browsed house listings, or had green eyes for the house down the street will be able to relate to Daum's near-obsessive behavior. And anyone who's anyone will find something here to laugh about, and something here to think about, and really, what more could one ask of a book about house shopping? "I just wanted that one perfect thing to cling to as my source of stability." Nat - Hope you enjoy it! I saw this one a while back, and I'm totally enamored with the idea of this book. Although, I have noticed it's astronomically priced in e-format. Blah! For first time home buyers, it is important to request for credit report to begin cleaning up outstanding credit immediately.